We had a very warm welcome from the hosts Candida and Salvatore and for the rest of our stay we felt very comfortable and at home. The apartment is very spacious, clean and well equipped to a high standard. It is ideally situated, close to the old town, restaurants and shops. The apartment exceeded all our expectations and we would definitely recommend this accommodation to our family and friends when visiting Alghero. cura per le cose e gli arredi dell'appartamento . We stayed for a week in this lovely apartment, and couldn`t be happier! We had a fantastic stay, everything was perfect and the apartment is even better than the photos. It is spacious, elegantly decorated, light and clean. It is such a beautiful apartment, fully equipped with everything we needed. The kitchen is very well equipped, there is also 2 tv´s (one with satelite), loads of extra towels, linnens, blankets, hairdrier and everything we would need for our stay. There`s a washingmachine and fridge with freezer, loads of closets and cupboards for clothes and shoes....Really, it`s all you need in this great apartment. It is also located perfectly for a great stay in Alghero. It is close to the sea, the bank, pharmacies, the postoffice, the supermarket, the bus, the historic town etc etc. We took the bus to our favorite-beach, Maria Pia, but walked to the Giovanni-beach. Also, it is nice to go for a walk/jogg along the promenade just a couple of hundred meters away from the apartment.It takes about 3 minutes to walk down to the historic town, which has everything, including lots of nice restaurants. The owners live in the same building, and it was really a pleasure to meet them. They are so sweet and very helpful in every way and we couldn`t ask for more. We spoke french with the husband. Upon arrival, there was bottles of water in the fridge and cakes on the table to welcome us. So kind, and they made us feel "at home" immedeatly. They gave us every information we needed about the apartment, the area and gave us loads of tips of what to see and do in Sardinia. We were a party of 5 : 2 small children (5 and 3), their parents and their grandmother. With 3 bedrooms and 2 rather large bathrooms, it was perfect. Also, there is a bathtub in one bathroom, which is highly appreciated by the children. We have all been to Alghero earlier, and would love to come back a third time. When we do, we know exactly which apartment we will rent. This one - it just perfect! "Just came back from a week long stay at this wonderful appartment. Perfectly situated a three minute walk from the old town, it is both central and sufficiently quiet to sleep well and relax. Also, it is in very nice neighbourhood, Via Fratelli Kennedy, which after three stays in Alghero has become my family''s favourite location. The apartment is spacious, well equipped, has two big bathrooms (one with bathtub, great for kids after the beach! ), and has balconies on three sides. One of the balconies - from the bedroom, faces the sea. Great view to wake up to! The interiour design deserves a special mention: delicate, comfortable and with that homely feel that makes your stay extra enjoyable. The owner has done an exceptional job here. Also, the service of the owners were great, and all in all we cannot wait to come back. Merveilleux l'appartement, tout comme dans les photos. La réception était parfaite, le propriétaire très attentif, toujours disponible quand nous en avons besoin.Appartement bien situé, dans le centre d'Alghero.Un appartement complet, tout fonctionne bien, je suis allé avec un bébé et avait un lit pour bébé, peut louer sans problème, passera d'excellentes vacances. L'appartamento della gentilissima sig.ra Candida è spettacolare! Si trova a 5 minuti a piedi dal bellissimo centro storico di Alghero, è spazioso e confortevole, ben ventilato anche senza l'uso dei climatizzatori presenti in tutte le camere da letto, arredato con stile e gusto e dalla pulizia immacolata. Un ringraziamento alla nostra ospite è doveroso: all' arrivo ci ha accolti con pizzette, squisita pasticceria sarda e un' ottima bottiglia di vermentino sardo, ci ha dato tanti consigli per trascorrere al meglio la nostra vacanza ad Alghero e nei suoi splendidi dintorni , inoltre durante il nostro soggiorno si è premurata in piu' occasioni di sapere se tutto procedesse bene. Grazie sig.ra Candida! Ci auguriamo di poter ritornare in futuro nella sua splendida cittadina. Wir, eine vierköpfige Familie, haben zwei Wochen in dieser perfekten Wohnung im Herzen Algheros verbringen dürfen. Schon vor unserer Anreise wurden ausführlich über Parkmöglichkeiten, Anreise, Schlüsselübergabe... informiert. Am Anreisetag wurden wir sehr, sehr herzlich begrüßt. Auf dem Küchentisch stand italienisches Gebäck, es lag eine Flasche Rotwein bereit und im Kühlschrank warteten kalte Getränke. Uns wurde die sehr saubere Wohnung gezeigt und die Funktion der Klimaanlagen erklärt. Wir haben uns von Anfang an sehr wohl gefühlt. Die Wohnung ist nicht nur sehr sauber sondern auch noch sehr groß und bei geschlossenen Fenstern sehr ruhig. Die Lage der Wohnung ist perfekt. Sie liegt in einer belebten Straße, die italienisches Leben widerspiegelt. In die Altstadt geht man fünf Minuten, zum Supermarkt ebenfalls, in der Nähe findet man Restaurants, Cafes und ein kleiner Felsstrand ist auch in fünf Minuten zu Fuß erreichbar. Nachmittags saßen wir häufig auf dem Balkon, der zu Straße gerichtet ist, tranken einen Expresso und beabachteten das bunte italienische Leben. Nachts konnte man sehr gut schlafen. Es war ruhig, alle Zimmer haben Jalousien und lassen sich komplett verdunkeln, zudem besitzt jedes Zimmer eine eigene Klimaanlage, mit der man die Temperaturen etwas nach unten regulieren konnte. Der nächste Sandstrand ist in etwa 20-30 Minuten zu Fuß zu erreichen . Allerdings gibt es dort relativ viele Algen, deshalb sind wir mit dem Leihwagen an einen der bildschönen Strände gefahren, die etwas nordlich von Alghero liegen. Die Fahrtzeit betrug etwa 10 bis 20 Minuten. Insgesamt ist diese Wohnung perfekt, um einen sehr guten Urlaub zu verbringen. 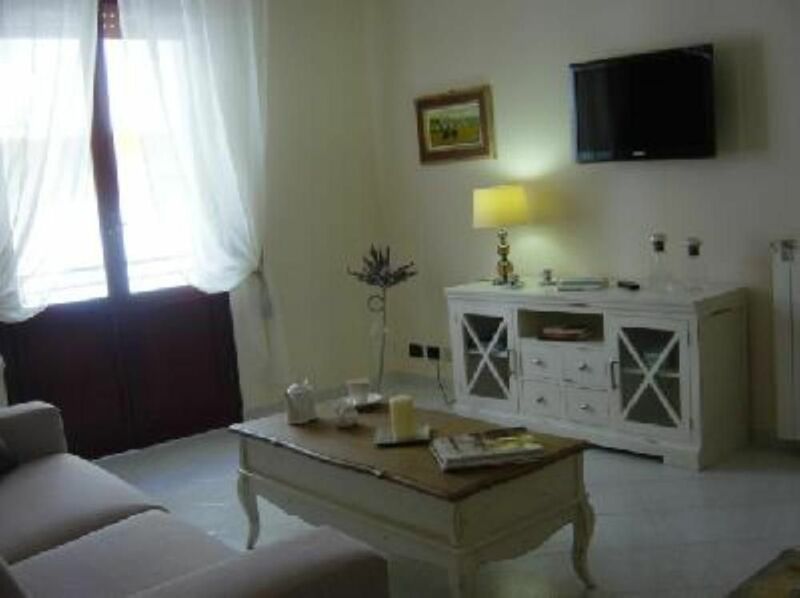 very comfortable apartment located in the centre of Alghero just a few minutes the wonderful seasight promenade , the beautiful rocky coast and the picturesque historic centre , It is near all the restaurants , bars , pizzerias , pubs , shops , supermarkets and banks . Modalità di prenotazione e di pagamento : . Acconto da versare , in via anticipata , mediante bonifico bancario . Saldo in contanti all'arrivo , al momento della consegna delle chiavi della struttura . Check out ore 10 ( salvo accordi con il proprietario ) Check in ore 15 Tariffe scontate in relazione alla durata del soggiorno .